Golfers should conduct their own research before purchasing a set of golf clubs. Golf clubs are a purchase that many people rush into without conducting the proper research and testing before making their final decision. As with any sizable investment, the purchase of clubs should not be taken lightly. Most golfers do not purchase a set of golf clubs on a regular basis, thus a process should be followed from the outset to ensure that the golfer purchases the right set for the right price. The preliminary research stage of a golf club purchase entails finding out what golf clubs are needed. This information is vital to conducting a thorough and efficient golf club search, as it will help place all of the options available in front of the golfer. During the preliminary stage, golfers should decide whether a full set of golf clubs will be purchased or only certain clubs, such as a driver, a fairway wood or a putter. 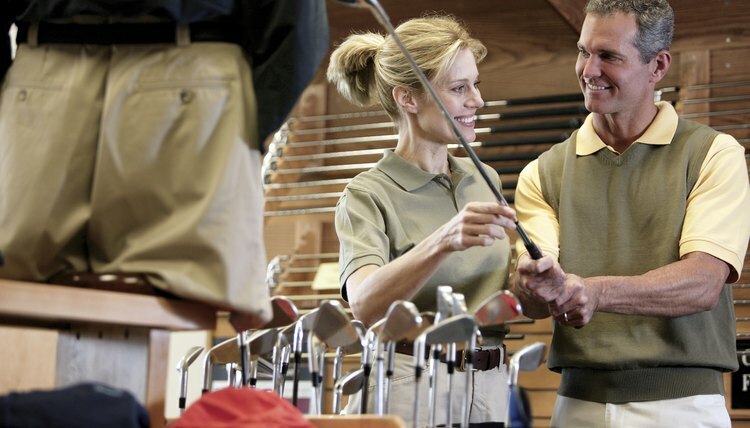 The brand name research stage of a golf club purchase will delve deeper into the process. The golfer, as a result of his preliminary research, should already know what golf club type he needs. The golfer should research all clubs by each manufacturer that match his criteria. Golfers should research each model that matches her criteria that are offered by each manufacturer. This research should consist of actual club testing at an indoor or outdoor driving range or testing facility, such as those found in many Golfsmith retail stores. This testing will give the golfer valuable insight as to which model performed best in the testing environment. An in-depth analysis that details each model's launch angle, ball speed and other results may be acquired if available at the retail location. The golfer should compare all of the data compiled through his research before deciding upon a specific model of golf club. Each step of the process should have provided the golfer with important data with which to make an informed decision about which golf club is best suited to his game. If needed, the golfer should make a list, marking down the pro's and con's of each set. After this thorough analysis, a confident and informed decision can be made. A final consultation with a buyer's guide may assist the golfer with his comparison. The golfer that has performed the proper research can enter a golf retail location to confidently make a golf club purchase that is best suited to her game. The golfer should already know her budget and the clubs that fall into that category. Customers should be ready to explain to the sales representative her intent to purchase and what clubs she has in mind, as this will allow the sales representative to more attentively serve her.